Back in the pre-digital sixties, Brisbane was served by several newspapers. In the mornings we had the Courier-Mail, a serious broadsheet that emanated from Queensland Newspapers, part of the Murdoch empire. The afternoon newspaper was the Telegraph, a tabloid that came from the same stable and was lighter in content with a heavy emphasis on sport coverage. The Courier-Mail also had a Sunday version called the Sunday-Mail, whist the Telegraph had a special Saturday sports edition printed on pink paper (don't ask me why - it's a mystery to me!) that was known by all and sundry as the Pink Sports. 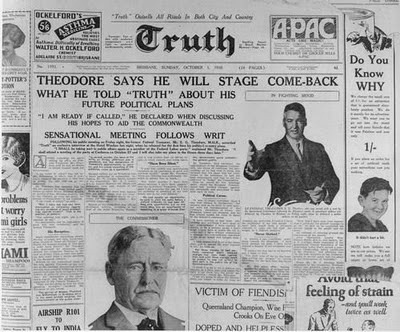 There was also another tabloid, the Truth and its weekend sibling, the Sunday Truth. We didn't get them at home because they were slightly salacious in content - if you look up Wikipedia, you'll see them referred to as "scandal sheets". 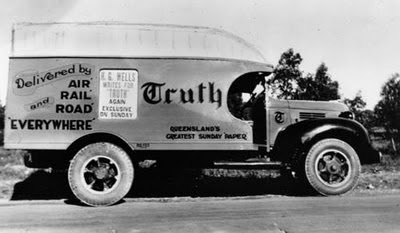 Here's a Truth delivery truck from around 1940. 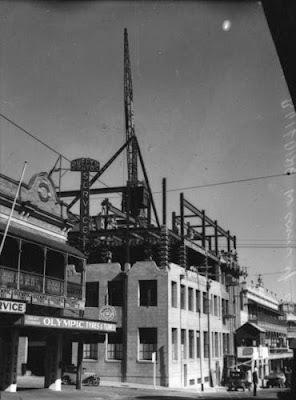 In 1937, a new building was being erected in busy Fortitude Valley, on the south-western corner of Brunswick St and McLachlan St. It was to be the new home of the Truth, and here it is pictured during construction. So, what do you do with an old newspaper building? Why, convert it to apartments of course! And that's exactly what happened. My recent photograph (above) shows the front of the Sun Building, which instead of journalists' offices and printing presses, now contains a mix of one-, two- and three-bedroom apartments. Great for those who want to live in the heart of Brisbane's live music and club precinct, Fortitude Valley. Hi, I actually live in the Sun apartments and i have been looking for some images of the former interiors of this building but I am not having any luck. Do you know where i could find some? It is a very interesting building to me and i would like to know more about its past. There doesn't appear to be much on-line information. May I suggest a visit to the John Oxley library? There is a lot of material available on microfiche that might be of assistance to you.